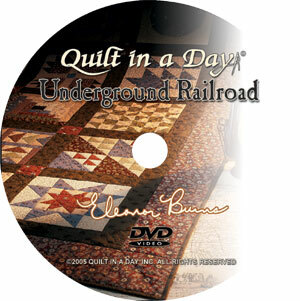 Jump aboard the train for a historical look at quilts from the 1860's and the significant part they played in helping slaves communicate "undercover." We'll gather our "monkey wrench" and hop onto the "wagon wheel," follow the "bears paw" trail through the mountains, and gather safely at the "crossroads." This is an adventure that you won't want to miss. Eleanor Burns shares a story passed down through families about a link between slave-made quilts and the Underground Railroad. 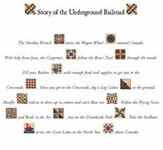 Slaves reportedly made coded quilts and then used them to navigate their escape. Traditionally, log cabin blocks were made with red centers, representing the fire, or hearth of the log cabin. Eleanor explains how one black center represented a safe haven for escaping slaves while she demonstrates quilting techniques. Turning log cabin blocks different ways signifies different meanings, as fields and furrows of the newly plowed field, a directional arrow, and the sun and shadow. Join Eleanor as she builds the blocks into a finished quilt. Flying Geese heading north for the summer represented slaves heading north as well. They were directed to follow the geese, and stop at the same waterways for rest and water. Follow Eleanor as she flies through a quick way of making four geese from two squares! Eleanor sets the blocks on point, and shows you how to create messages in your own quilt by placement of blocks and quilting stitches. This will not contain yardage charts.